With the current changes in our production, and the increased demand, we are building BECK SPEEDSTERS and BECK SPYDERS as quickly as possible to fill our existing order backlog. Our Lamination Dept. is working hard to keep up with the orders, and will be producing body and chassis kits that will be shelved until a future customer determines the final color scheme. This allows us to be more flexible and fill orders more quickly. Silver remains the most popular selectiuon. Current lead time is approximately 14-16 months from receipt of deposit to delivery of your BECK. 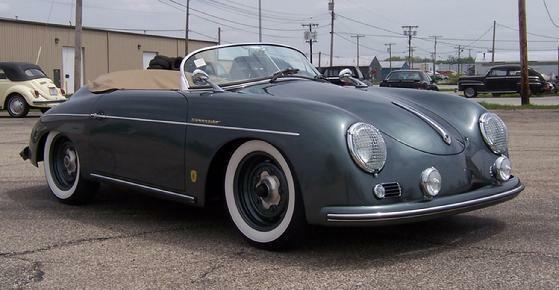 The picture below is an excellent example of a custom color, with color matched wheels, wide white wall tires, etc. These are 2 Pre-Assembled Body Packages.